The next four exhibits from Paul Wildman, the third co-authored with Iona Miller and the fourth with Jim Prentice, relate to Transhumanism in its contribution to emergent forms of life, as well as the need to reconnect with the Artisan/Artificer/Sauvage/Handwerker now largely invisible in our burgeoning TechnoUtopian culture – this is where the Makers and Hackers (a forthcoming issue) will have their say. I hope this inclusion goes some way to helping them be heard seen and felt. The fourth posits four scenarios for the potential development of Transhumanism over the next 35 years the same timeline as the Millennium Project included above. Scroll over: In this article we posit the view that the Humanist |Transhumanist debate urgently needs to introduce a vertical dimension to balance the dominant horizontal one. In short we need a bridge between the Human and the Transhuman. And to this end we posit that the Bushy/Artificer as one such bridge/link between the shaman and the mason, between the chthonic and the ethereal. For us this is, in many ways, a last gasp for humanity that TH as a version of the Bushy/Artificer can assuage this yang yin tension. Wildman, P. and I. Miller (2013). Ancient Wisdom for our Modern Age? The bushy and the transhuman in the context of an Archaic Renaissance. Crafters-Circle [www.crafters-circle.com](3): 13pgs. upcoming. In this article we suggest that the Humanist |Transhumanist debate urgently needs to introduce a vertical dimension to balance the dominant horizontal one. We need a bridge between the Human and the Transhuman to reconcile the opposites. We suggest the Bushy/Artificer is one such bridge/link between the shaman and the mason, between the chthonic and the ethereal. In our view TH as a version of the Bushy/Artificer can help us assuage this yang yin tension before humanity's last gasp. Today we do our best to live in a world going mad. Mass psychosis is evident, particularly in the West. We are trying so hard to escape the past we paradoxically destroy it. We destroy our past, our obsolete products, the environments and ultimately risk destroying our planet’s future. Is this blighted world our legacy to our grandchildren? Please let’s say “no” to this bleak potentiality. To do so, we need to find a way to move creatively into our increasingly technological future, while simultaneously trying to become more fully human, not more robotic, dissociated, and disconnective – much less electronic. The high-tech world of H+ is chasing us with a plethora of invasive innovations designed to extend and enhance our lives. Yet we know each convenience or remedy such as artificial organs, haptics, or enhancements comes at the price of our fundamental humanity. We may evolve; we may just not be quite human, anymore. We need to pause and ask ourselves if our humanity is, indeed, so readily disposable. Can we take some sort of ‘psychic vaccination’ to inoculate ourselves from this psychosis disease by incorporating it into ourselves? As with the healing art of homeopathy we need to realise, that which causes a symptom can also heal it. We need to focus as strongly on our basic humanity as we do on the latest electronic gimmicks if we are to create the life we want and the world we need. This process connects us with the mythological figure of the wounded/divine healer (such as Asklepios, Chiron and Christ), who suffers through the sickness that they are able to heal, yet have, and live, practical lives even of the humble carpenter. In this scenario, every manual labourer is confronted with the hero’s evolutionary task which demands adaptation and resilience. This is a cross-cultural dilemma that affects every person in every nation on the globe. This archetypal journey traditionally requires a shamanic tincture, elixir or panacea that helps us navigate the darkness and light of our own depths. By consciously descending into our depths, we ignite a light in the darkness. We recognize the crossroads that transhumanism presents and we illuminate and kindle our human potential in an attempt to reconcile and balance the dissonance of these seemingly separate futures.2 We place a high value on becoming more fully human even while science leads us toward a biomechanical age. We aren’t quite sure what this new “human” will look like. But we want to consolidate not overthrow the evolutionary adaptations of our species. We ignore it at our peril. Can the Transhumanism assist us in this dilemma and if so how? In our recent article in Scientific God Journal (SGJ) we argued: Human consciousness is a self-referential system which embodies the principle of connection between action and logic and chaos in holistic (‘whole brain’) awareness. Miller and Wildman (2012a). Realising the mythological, ‘symbological’, even dream-like nature of reality collapses the boundary between spirit and matter, as matter has become ‘spiritualised’ (blessed) and spirit has become ‘materialised’ (incarnate), i.e., blessed star-stuff. Some ontologies such as New Age orientate themselves at the spiritualised end of the ‘spirituality’ spectrum while some, such as science, Marxism etc. are completely materialist. In this piece we outline a system to interface the two in a self-organisational, even alchemical, way starting at the local level. So as sensory-motor haptic creatures first and foremost, rather than cognitive, we seek the blessing of incarnation3. TH extends this concept of incarnation however it can be a blessing or a curse an Eros or a Thantos. Now is the time to choose: If not now, when? If not us, who? If not here, where? We argue that masonic and shamanic rituals we discuss here along with the Artificer are part of our western cosmology. Today techne has become a minor, silenced and pejoritised part of our Zeitgeist. Indeed, we strongly submit that today through techne we need to re-member our lost hands. Toyoda (2006). What will be the Logic base uploaded at the Singularity? A vital role for Transhumanism? It is to this holistic system of learning – artificer learning that we now turn. So that in this article we will expand and concretise our previous work and argue that this practical learning process is one valid method of psychic inoculation and a vital component of shaping a TH logic base/operating system. For example Isaac Asimov’s three laws of robotics are an embryonic logic base that can be coded as a TH operating system. Where then does this leave Universities and Religions, esp. the Abrahamic genre who are generally locked into for instance ‘the humanities’? We argue essentially these constructs of the Nation State have essentially missed the boat – will for instance the Universities ‘Humanities Faculty’ be renamed ‘Transhumaities Faculty’? Will cyborgs be ‘saved’? Our hunch is that they will be proposing marriage to our great grandchildren. We argue that masonic and shamanic rituals we discuss here and thus the Artificer are part of our western cosmology just as today techne has become a minor, silenced and pejoritised part of our Zeitgeist. Indeed I strongly submit that today through techne an ‘eros/creactive/polylarity/harmonised heuristic diversity in the context of heuretics’ logic base where we re-member our lost hands a sort of chiro-cybernetics. Toyoda (2006). Or will it be a ‘thantos/mastery/singularity/centralised algorithmic conformity in the context of scientifics’ logic base as President Obama says ‘I have two words for terrorists (even if they are American citizens who have not been charged with any crime) ‘Predator Drones’. Not only Robot Rights, McNally and Inayatullah (1988), I would posit Chiro Rights that is the rights to use our hands i.e. to artifice. Masons and to an extent Shamans are well aware of the importance of ‘techne’ as compared to ‘techni’ hand work. In essence, CRAFT in particular, and groundedness in general, give us a grounded ness where machines are an extension of our humanity. We are no mere extension of the manchine, so to speak. It is through transhumanism that we can express the heuretic within the science which is re-interpreting and re-creating our society in its own image. A heuretic approach is not heuristic or hermeneutic. Ulmer (1994). Yet, as we perceive it, many ‘new agers’ and the masons in particular have the view that becoming spiritual means leaving ‘dense matter’ and becoming aware of the ‘divine plan’ in the ‘ethereal realm’. This article argues that to this extent, they and we suffer from the Western malaise of ‘displaced concreteness’. In effect they forget their route and only see the destination: a trip to ‘higher consciousness’ is imagined like a train journey on a train line made by others with predetermined stations. Each previous station is left behind and is of little, or no, subsequent consequence. Like Jung we prefer to view the journey as one of building a cathedral or house with our hands. The organic design changes as we work through the life project. Chartres Cathedral was built in this way by master masons, taking over a century to complete in 1250, without an architect, an overall plan, measuring unit, or common language. Further, when building a cathedral the roof is erected relying utterly on the foundations (previous stations) below ground. Miller (1996). The metaphor is the message! We must retain our firm foundation in human values and manual dexterity. Another fundamental flaw we find in H+ theory is that the scientific, technological and thus transhumanist thought is considered senior, abstract and preferable to the embodied and incarnated which is pejoritised as densely material, grounded and even tainted. Yet from an evolutionary point of view using our hands to grow our brains and build our simple cathedrals of archaic times led to the development of consciousness and the masterpieces such as Chartres. So chiro drives cogno not the other way round. Thus, we submit that our hands are the doorway to our broader and deeper consciousness. Here the danger is that transhumanism may become about consciousness but it is not achieved by repudiating the ‘creation’ of our grounded nature that embodies this consciousness. Jung warned that premature or ungrounded fantasies of transcendence were escapist. The Exemplar Project of the Artificer can seen as a mirror that reflects our spiritual dimension in the synchronistic and synergistic congruence between ‘inner’ and ‘outer’. Imagination is structured by the archetypal potentials of the unconscious. Archetypes structure the possibility to generate, entertain and entrain such ideas. The archetype itself cannot be known but structures everything we come to know. Their totality functions as a psychic organ. Universal themes appear in distinct cultural garb. Miller (2012a:509). Paradoxically when we look into the depths of matter, we look into the depths of ourselves and find the universe mirrored within. The world we live in lives in us. Religion and spirituality are largely about trying to understand the nature of consciousness in relation to the cosmos. So it is completely logical and natural to expect that we might actually come to understand the religious aspect of existence by following the conscious mind into its source nature in Nature. Crisscrossing patterns occur when two or more waves ripple through each other. In the transactional interpretation of quantum physics, waves of probability originate in the past, present and future. Events manifest when waves from past and future interfere with each other in the present. That pattern creates matter and energy. Universe emerges from the rippling effects of immense numbers of crisscrossing interference probability waves. The geometry of this unified field, is more fundamental than the fields or emergent particles themselves. In Ultraholism the poetic, symbolic language of the unconscious (Traumbildsprache - picture (dream) language) is this wave language of Nature. The unconscious is Nature-in-us, hence, from the point of view of the human psyche, everything is symbolic or mythic. Math is one subset of such language. The foundations of myth, and thus science, arose in the trance states of early shamans and yogis. Miller (2012b&c). Today the collective or cultural dream is an endangered species that withers in the face of hi-tech and big-pharma. We needs to bring our dreaming of a better world back from the brink. Autopoietic small scale communities can assist in this regard by demonstrating today that a better world is possible tomorrow for our children. Dreams are in a sense feral, sauvage, bush mechanic, wild, paleo, directly embedded in nature. They come from an era where we spent 99% of our species’ pre-history as hunter gatherers – in short our two-million-year-old-self. So that today we pejoritise the sauvage as savage – red in tooth and claw, the feral as ‘stinkie’, paleo as primitive and dumb and valorise our technology and indeed spiritual paths that privlige3s the narrowly conceived cognitive and pejoritises the chiro thus removing us more and more from nature. We constantly think in symbols, and symbols are to the mind are what tools are to the hand – an extended application of its powers. Space and time are no longer considered hard objects, but rather the tools our mind's hand uses to weave everything together. Miller (2012b:502). Everything we see and experience right now is a whirl of information occurring in the mind’s eye in the domains of space and time. When we become conscious of our mind’s hand, we can apprehend the swirling symbols of consciousness, space and time. Marshall McLuhan says: “We shape our tools and then our tools shape us”. In fact, there is no such thing as solid matter at all, no hordes of tiny particles. All manifestations are reduced to probability waves in quantum mechanics – an ephemeral yet living field – a quantum world. This entanglement of the individual into the collective is an ‘ego death’. As per Miller (2012b:456), the dead void disappears once we connect with the fertile void of the dynamic ground; the formless state of pure potential. Today we have to not only reconnect the dots, we have first to find them, and then re-member those that are no longer extant. To do this we need to find the shards of the coherence and resonances of archaic times and re-new our connection and commitment to them. This re-connects us to the fabric of our own deep planetary history and beyond which is also our future. Symbols will arise from and be embedded in this journey as holographic fields of energy. 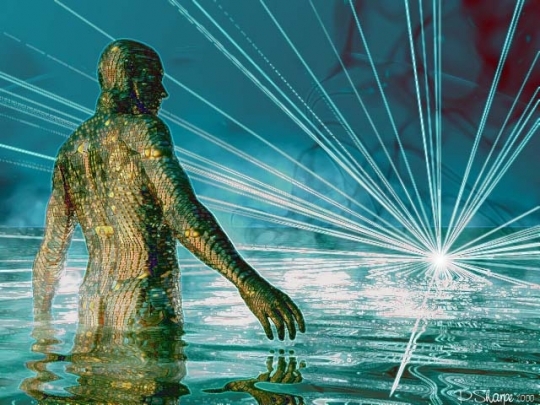 The gist of the holographic paradigm is that there is a fundamental reality that is an invisible flux not comprised of parts, but an inseparable interconnectedness. Indeed, there is evidence for the holographic nature of nonstandard fields -- the zero-point field (a candidate for the unified field), the psi field of psychic phenomena, Ervin Laszlo's Akashic field, and the morphic field proposed by Rupert Sheldrake. Miller (2012b:452). Following Jung, we suggest that these holographic nonstandard fields exist within the overall field which is our Unus Mundus - the final reuniting of our spirit, soul, and body/head, heart and hand with the world soul. This introduces the idea of ‘deep craft’ Man-ip-ulation – As Varela, Thompson and Rosch (200:81) suggest, the strength of science may lie precisely in the fact that it gives up living among things and prefers to manipulate them (as objects) instead. Yet here we still see the principal lacuna in modern science. In this suggestion we still see the separation of subject (man) and object (-ipulator) to the exclusion of experience of our interconnectedness within the thinking and doing, where subject and object are braided. We now turn to understanding this Achilles heel of science to facilitate such deep experiencing. We call this Deep-Craft or even Slow-Craft.4 In an attempt to re-reconcile these dualities we call for an Archaic Renaissance wherein the Deep-Craft of the Artificer is the ‘point person’ so to speak in this remembering and practically demonstrating this re-braiding, this re-membering the ‘thinker’ and ‘doer’ as conjoint. In turn, this re-introduces the ancient Greek philosophers, Thales and Pythagoras, who studied political ethics through the Egyptian Mystery Schools. Predating the Greeks by millennia, the archaic sensibility resonates with our two-million-year-old-self. (Stevens, 1993). Here the ‘mythamatics’ includes the Greek mathematics belonging to the archaic Egyptian sacred geometries of life and still earlier archetypes. Our deep primate and thence mammalian ancestors had been fused into political law, ensuring that politics became responsible for mercy, compassion and justice. This became the basis for the Greek Science for ethical ends, explaining the existence of such things as modern hospitals and pension funds. Somewhere along the way our compassionate human safety-net programs fell prey to a rigidly mechanistic bureaucracy. Now such programs (for the aged, disadvantaged, or mothers and children) are rapidly disappearing altogether, as each of us is left to fend in a hostile world for ourselves. Without them, we barely dare call ourselves human, for we have left such humanity behind in a psychotic rush toward a dystopian future. During the early Australian Federation period, every town in Australia had its own local School of Arts, Literary or Mechanics Institute. Along with the Workers Education Associations well over 2000 of these centre's existed throughout Australia with the Sydney Mechanic's School of Arts being the largest, all with their essentially experiential and heuristic pedagogy. The bushy or Bush Mechanic (formal title Artificer) was widely recognised, accepted and, indeed, respected. The colloquial expression, To use one's Nous, was part of the Australian vernacular at that time, indicating a far different 'bush mechanics ' attitude to intellectual endeavour than the current failing educational system, which is only widening the gulf between science and art. (Pope, 2006). We argue that Shaman /Pagan, and Mason /Xtian are mirror images of each another – held together by the Lord of Two Ways – as it is above so it is below. However the object, the mirror, and the image are all three completely separate, yet completely interdependent, entities and in a strong sense the latter depends on the middle, which depends on the former for all three to exist. We suggest that the artificer can be the image that is the bond between the two ways of Shaman and Mason. We urgently need a vertical understanding of Transhumanism so that we posit an Artificer Transhumanist as a fusion that can carry us into a future that retains ‘humanity’. An ecological vision demands gender reunion where the sky king father god – masons/priests – heavenly ethereal energies – chemistry, science - theology, lovingly embraces the counterpoint of earth queen mother goddess – shaman/wizard – earth energies – alchemy/artificer - ecology. Ecopsychology (Roszak, 1992) studies the relationship between human beings and the natural world through ecological and psychological principles. The field seeks to develop and understand ways of expanding the emotional connection between individuals and the natural world, thereby assisting individuals with developing sustainable lifestyles and remedying alienation from nature. So in the following sky father and earth mother are exchangeable, but not interchangeable, as they both relate to linking esoteric/transhumanist and exoteric/humanist. As the former seek to leave dense matter to the ethereal realms of consciousness whereas the latter have done the reverse and if anything seek to enter the dense matter earth labyrinth under the world tree for their praxis and there find their ethereal realms. So it is a case of Mason∞Shaman (theology∞ecology | above∞below | ether∞matter | transhumanist∞humanist) each reflecting aspects of the other, while distinct but conjoined. In the fairytale, Alice found there is life on both sides of the mirror. We may locate both within a bigger circle thus showing either mason ‘and’ shaman so that we acknowledge both are of ‘star stuff’. In many ways this earth is ‘star stuff’, disrespected by us and our refusal to honour Earth and our own star stuff. Ultimately as Sagan says ‘we are all made of start stuff’ that is the sky/heavens above (sky father - up) and the ground we walk on (earth mother – down), ourselves. In many ways we can say that morphic resonance binds macro and the micro stuff with vertical dimension of liminal and subliminal consciousness. For instance Sheldrake’s morphic resonance see 1. Ken Wilber, in A Brief History of Everything, speaks of the advantages and disadvantages of ‘ascender’ vs. ‘descender’ thinking: He describes two streams of spiritual movement 1) the ascending path of evolution embodying the One in the Many, and 2) the descending way of the Many in the One. Ascenders and descenders have been unable to integrate these two spiritual streams, leading to polarizations in culture and thought that lead inevitably to conflict. The ascenders try to deny the material altogether, while the descenders try to make it into God. Clearly, we need a new way of thinking that recognizes, reconciles, and transcends both. I am the Lord of two ways: ‘But I, I am lord of two ways. I am master of up and down. of the Morning Star in my eyes. Lo! I am I! The lord of both ways. Thou wert lord of the one way. Now it leads thee to the sleep. Farewell ! Overview In the interface of Shamanic | Masonic we propose applications that integrate Transhumanist Artificer practical learning development blended with the Shaman’s | Mason’s wisdom learning development. This is in line with what we understand of the Shaman’s | Masons origin in practical skills. Indeed, all learning resides in practical skills – a crucial method in Adult Learning. We call this a ‘deep system’ method that is systemic (whole system focus) rather than systematic (system component focus). Ison (2010: 50-51, 81, 128). Moreso it has a vertical (understanding) and horizontal (system components) axis. Detailed discussion of such approaches is beyond the scope of this article however we have explored this in considerable detail in the sense of validating experience and our ‘lived life’ as the locus of authenticity for our ‘grounded and local’ approach to scientific endeavour. This approach is called Reflexive Praxis and has been pioneered by the first author. Wildman (1995) and Wildman and Miller (2012b). We argue strongly that such ‘deep system’ approaches such as Reflexive Praxis, as we propose in this article, are crucial to understanding the longitudinal, political, economic and social impacts and implications of Transhumanism. Furthermore we propose a vertical and horizontal learning process. The vertical layer is the Shaman | Mason’s program and the horizontal layer is based around Artificer/Practical skills as set out below. Much of this work draws from our proposals in the past; however, now their urgency can be seen with more alacrity. This learning matrix seeks to interface CRAFT in the practical sense (horizontal axis) with CRAFT with the esoteric sense (vertical axis). This is a re-membering of Shaman’s | Mason’s origins and in its hands-on practicality is a complement to virtual social media that has obsessed so many young folk today. This proposal seeks to integrate the two while re-taining and re-membering their distinct uniqueness. Our proposal seeks to re-member these basics by extending this understanding of Craft and application of such skills in everyday life and secondly to a possible genetic homologue.5 Such skills include hand skills in general where the hand leads the head and is non-gender specific, including gardening, seamstressing, etc. as well as the traditional trades AND innovative ones such as Biochar production and use, community economy and so forth. 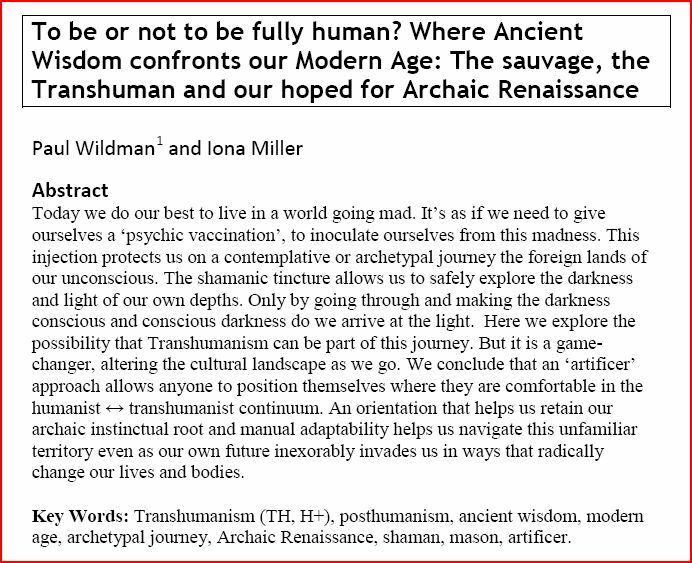 Specifics of our Adult Learning Transhumanist Artificer Guild Proposal In this section the term Artificer is used to encompass both sides of the coin that is Masonic and Shamanic. See also2. We deeply recognise and respect the position that Myths are like collective dreams; ritual is an enactment of myth. Both the Shamanic and Masonic paths have their rituals. In the following we seek to establish, or at least suggest, such a ritual program for the exoteric Transhumanist Artificer -- one that interfaces with existing rituals. Here the students learn about and practice the integration of (1) Adult Education methods, such as Learning Circles and Action Learning, with (2) the Artificer Bush Mechanic Principles, (3) Shaman | Mason wisdom with (4) transhumanist principles and projects to a point where they can design and operate their own TH action learning circle, when they return to their home community. Heuretics is a form of anti-method and represent a step towards literacy in a digital age (therein called electracy) which asks not what does a text/experience mean (hermeneutics) but what can be done with that meaning i.e. an action/praxis orientation. In short the recovery of experience. Foster (2007). involve an eBook resource and fBook social media and Google group discussion, etc. and membership of the Science-Artificers Guild blog4. 2) The Transhumanist Artificer now becomes a member of the Science-Artificers Guild - say http://science-artificer.iwarp.com/index.html and membership of the Science-Artificers Guild blog, and our Facebook page http://www.facebook.com/Crafters.circle . 3) The Guild has a DeepCraft eZine such as CRAFT - http://www.crafters-circle.com and https://groups.google.com/forum/?fromgroups#!forum/craftyexchange . We have sought to do this with www.kal.net.au/adultleaning where the site nominates several peer reviewed Artificers. We would welcome the opportunity to extend this to include Transhumanist Artificers. Intergenerational options are offered for youth and seniors. Comprehensive applications could offer a scaled down version for children and young adults. A model not unlike a Scout-like group for boys and a Guides-like group for girls could mix and match basic skills training. Those who undertake the exoteric program here could pass on their knowledge of bush, survival and collaborative skills to the young ones over one afternoon, or a fortnight. Artificering can also be introduced as a program in play groups for small children – kiddie artificers. A scaled up version can be offered for seniors especially since we tend to have had a most practical childhood and now have the time to mentor others and pass on skills as well as learn from, our youth. Through mentoring, an ‘elder artificer’ is part of a trinity: Elder, Artificer and Sustainable Lifestyle – after Ross Welch (2012), resulting in, and generative of, an inner/outer harmony. Indeed the Masons can be seen as an umbrella group -- one giant men’s shed and Shamans playing in the mud of childhood and so forth. Mar and Par Artificers as part of Volk system of intergenerational learning. In this article we have sought to identify a stable deep-craft7 adult learning platform for a bridge that can be anchored (at least temporarily) against the currents (notwithstanding floods!). Such a bridge can be built from each side of the transhumanist-humanist divide. Depending on necessary design criteria and resource availability, we each can craft and contribute our own link to the overall effort. the practical lived life skills on one hand and sharmanic | masonic | hacker type techne skills on the other - all in a practical way for the general good. In this way, we propose we can re-member the wisdom of our past for us today and our children tomorrow. These steps are vital in a world facing economic and environmental apocalypse. 8 These are the skills of our grandparents and indigenous communities. They will become crucial again, however, they will have to be re-membered before it’s too late to pass on such vital skills and spinning, weaving, and journeyman-type trades. We hope there is still time. The bushy then could be seen as the Transhuman who strives to become fully human by honouring the past while acknowledging the future. We are most keen to hear from Shaman’s or Masons interested in pro-actively moving this ‘bridging guild’ suggestion forward9. Miller, I. and P. Wildman (2012). Ancient wisdom in the Modern Age: An Archaic Renaissance. SGJ (Scientific GOD Journal). 3(6): pgs. 578-592. Adorno, T. (2003). Can One Live After Auschwitz? Stanford, Stanford University Press. 525pgs. Foster, R. (2007). Adorno: The Recovery of Experience. New York: State University of New York Press. 235pgs. Frye, R. (2000). In a Strange City - selected verse and prose. Brisbane: Post Pressed. 61pgs. Ison, R. (2010). Systems Practice: How to Act in a Climate-Change World. Milton Keynes: Springer. 340pgs. Levy, P. (2012). WETIKO: The Psychospiritual Roots of Evil. USA, Published by the author. 209pgs. McNally, P. and S. Inayatullah (1988). Rights of Robots. Futures 20 2: 119-136. Maturana, H.(1970). Autopoiesis, Structural Coupling and Cognition: A history of these and other notions in the biology of cognition. University of Illinois: Urbana. p.30pgs. Miller, I. (2012a). Metaphorms: Physics Is Not Beyond You and You Make It Matter: Part I Journal of Consciousness, Exploration and Research (JCER). 3(5): 500-523. Miller, I. (2012b). Ultraholism: The Field of Infinite Meaning. Scientific GOD Journal (SGJ) 3(5): pgs. 452-473. Miller, I. (2012c). Zero Sum Game: Pre-Physical-Existence & Psychophysical Reality. Scientific GOD Journal (SGJ) 3(5): pgs. 502-520. Miller, M. (1996). Chartres Cathedral. Hampshire UK: Pitkin Guides. 100pgs. Miller, I. and P. Wildman (2004). The Demiurgic Field: It’s Patterning Role in Chaos, Creation, and Creativity. Scientific GOD Journal http://www.scribd.com/doc/98802448/Scientific-GOD-Journal-Volume-3-Issue-5-Toward-the-Unification-of-Science-Spirituality . 3(5): pp. 474-501. republished and revised (2012). Pope, R. (2006). Re-Defining Aesthetics to Develop Human Survival Technology. 2006, Science Art Research Centre: Uki NSW. 30pgs. Roszak, Theodore. (1992), The Voice of the Earth. Stevens, A. (1993). The Two Million-Year-Old Self. Texas, Texas A&M University Press. 163pgs. Toyoda, S. (2006). Memories of Our Lost Hands. Texas: Texas A&M University Press. 163pgs. Ulmer, G. (1994). Heuretics: The Logic of Invention. Baltimore: The John Hopkins University Press. 265pgs. Varela, F., E. Thompson, and E. Rosch. (1993). The Embodied Mind: Cognitive Science and Human Experience. Cambridge USA, MIT Press. 308pgs. Welch, R. (2012). The Sustaniable-Artificer-Elder Triunity. Self-published and discussed in personal communications with the second author. Wildman, P. (1995). Research by Looking Backwards: Reflexive Praxis as an Action Research Methodology. In Pinchen, S and Passfield, R. (eds) Moving On: Creative Applications of Action Learning and Action Research. Brisbane, ALARPM (Action Learning, Action Research and Process Management Association) . pgs171-192. Wildman, P. (2003). Economics for a Wriggling Universe: Economics and the Science For Ethical Ends. Conference paper from: Human Science Technology - Harnessing Negentropy for Human Survival. Uki, NSW, Prosperity Press. 27pgs. Wildman, P. (2011). BioChar Action Learning Circles: toward a future Nature can live with. Action Learning Circles based on Paul Taylor's The BioChar Revolution book (2010). P. Wildman. Brisbane: The Kalgrove Institute, with Topic Guides - 40pgs + six topics each 5 pgs. Wildman, P. and L. Cundy (2002). The Esoteric Thesis: Making inner sense of the ineffability of knowledge obtained during the exoteric research process. ALAR Journal (Action Learning and Action Research) 7(2): 3-21. Wildman, P. and I. Miller. (2004). Artificer Learning through the Demiurgic Field (DUF) of Dreams. [Web publication from Iona Press and Prosperity Press, Brisbane - web publication]. Available from the authors. Wildman, P. and I. Miller. (2006). Practalising the DemiUrgic Field through Active Practical Wisdom - how the artificer seeks to transform the world. Journal of Chaos Magic. Web Journal Chaosmagic now available from the authors: p. 15pgs. Wildman, P., & Miller, I. (2012a). The Esoteric Thesis: Unspeakable Things & Unknowable Truths. Scientific God Journal, 3(6): pp593-605. Wildman, P. and I. Miller (2012b). God’s Fingerprints: Using Reflexive praxis to identify underlying social neg-entropic patterns in our Wriggling Universe. Scientific God Journal (SGJ). 3(10), pgs. 936-954. 2 Levy (2012:18) has well developed this position. Further Christ/Christos can be seen symbologically as the ‘sprit moving on the deep’ that is the one, the Demiurge the Cosmic Artificer, who calls forth creation from eternal sleep in the DUF. Esoterically then Christ may be considered the original archetype for Artificer. 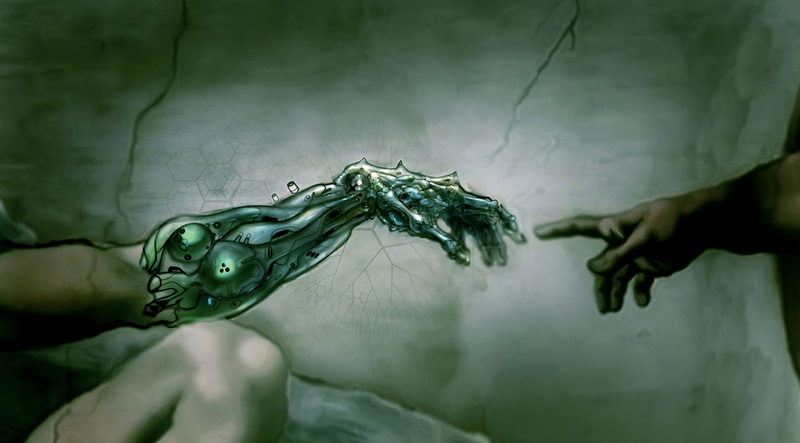 Transhumanism then, post singularity, is where we become our own Christ – our own creator – our own god. 3 This is a tough one as the authors are aware personally of the strictures of old age and cancer and loss of loved ones as well as some of the suffering’s of Gaia with overpopulation, mass-extinctions, pollution, global warming, poverty and war and the emergence of transhumans and even posthumans with the prospects of ‘TerrorTerminatorCloneDrone’, ‘NanoNightmare’ and fear based ‘PermaWar’ already with us. Most of these are human induced or at least influenced. This is NOT the logic base/operating system we recommend for upload at the singularity. We would argue we are not discharging our duty of care to ourselves, our communities our planet and we use a totalitarian materialist way of social development that bends everything to please us and especially the ‘power elite’. This is a hugely different path from what we propose our view of incarnation is one of spiritual-incarnational-techne-intersubjectivist symbiosis not materialist techni-positivist thrombosis. We find many indigenous cultures live to the former heuristic we to the latter. 4 http://www.youtube.com/watch?v=RWknU4qZPh0&feature=share . Deep-craft has a vertical (consciousness) and a horizontal (skill set) dimension. We see here the meaning of Artificer as the step beyond Artisan (who specialises in one skill set) the artificer practices the adage ‘jack of all trades and master of ~ several related ones’. Certainly we have the application of the 10,000hour guide as to obtaining this level of expertise usually over a 5-7year period much like the Medieval apprenticeship or the Jesuit training period of 7yrs. Expansion of this meaning is given available below on the www.kal.net.au website under ‘Adult Leaning’. For us this is the basis of a long hoped for Archaic Renaissance. See also Miller and Wildman (2004:478-479) republished and revised (2012). 5 Genetically we find biogenetic research today indicating that higher level cellular properties are embedded in our self-organising underlying genetic system. For instance our genetic code with its protein sequences as encoded in our DNA. It is now clear however that these coding’s are capable of efficacious action in a protein if, and only if, they are embedded in the cell’s metabolism i.e. in a biomimetic sense the self-organising cell’s bottom up every-day relational lived life. Both authors are well aware that here we are proposing another path to learning other than the Status Quo tendency towards cognitive uniformitarianism in physical and social sciences all in order to proclaim triumphal Western progressivism codified in Status Quo Pedagogy. Separately we have each: (1) physically, mentally and emotionally travelled the path we propose here and furthermore, (2) been exposed to vicious ‘intellectual well poisoning’s’ via. distortion, lies misrepresentation, claims of incompetence and ad hominem attacks all without recourse to reply and with few colleagues, in the game, coming forward in solidarity. We also submit that such ‘intellectual well poisoning’ may well validate a deeply buried trauma in our collective unconsciousness that irrupts with such irrational frenzy. The possible re-demption of such a tragedy is for us is what we seek to redress in this piece in particular and indeed in this Journal in general. 6 Wildman, P. (2011). BioChar Action Learning Circles: toward a future Nature can live with. Action Learning Circles based on Paul Taylor's The BioChar Revolution book (2010). P. Wildman. Brisbane: The Kalgrove Institute, with Topic Guides - 40pgs + six topics each 5 pages. 7 See http://www.youtube.com/watch?v=vLoPiHUZbEw for a brilliant exposition on Deep Craft – this is the type of Archaic Renaissance we are discussing in this article that can portend a techne based liberating and consolidating transhumanism. 8 We note that in relation to conventional religions possibly the Mormon Church and Buddhism are appearing as the most host positive towards Transhumanism whereas most other conventional denominations are functionally asleep at the wheel. Those that form intentional communities such as Amish and Mennonite what represent a respect for Archaic skills simultaneously, by limiting education to at best primary school, effectively in a sense eliminate their capacity for higher order social critique. We find this tragic in this juncture of earth’s, and our species, history. The first author has been unable to find any serious engagement with Transhumanism in any mainstream Davidic church (Christian, Islamist and Judaic) these three faiths comprise @2010, 2.1b, 1.5b and 14million respectfully i.e. over one half of the global population. Buddhism has about 1.7b adherents, and this belief system is also I suggest blissfully unaware of Transhumanism as such though many TH adherents describe their value set as Buddhist, and the Dali Lama is reportedly having said that that he believes ‘an artificial consciousness is attainable and should be treated and respected as a person’. Of course Atheism inc. humanism comprise some 1.1billion and most of these folks would possibly also be host positive to TH. Hinduism 1b (along with Buddhism) share many TH related beliefs esp. in the acceptance of alien viz. TH life. So on this basis we can suggest that in aggregate the globe is even balanced between those mainstream belief systems that would be potentially host positive and those what would be host negative wrt TH viz. 3.8b cp. 3.7b respectively. Source: http://en.wikipedia.org/wiki/List_of_religious_populations ; http://jetpress.org/v19/dvorsky.htm on Buddhism; and http://jetpress.org/v17/manoj.htm on Hinduism. 9 Both authors, and several others, have self-paced themselves through this beta program. Further the second author even approaching two masonic groups he was aware of, and had been tangentially involved with over the past three years however neither were interested. Further both our attempts to gain traction with shamanic organisations have also drawn a blank. The outcomes of this process for the second author have led to this proposal, see also www.kal.net.au under the ‘Adult Learning’ button at the top right. In turn this was part of my work to find ‘patterns in our past’ that’s meta data, patterns and chreodes in ones praxis say over a decade long period. I have called this process Reflexive Praxis’ Wildman (1995) and these patterns are then seen as part of the Exoteric Thesis. Wildman and Cundy (2002). 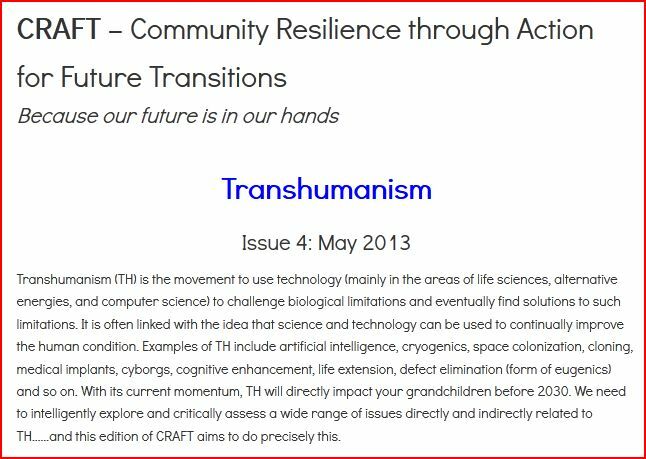 Theme: Transhumanism CRAFT: RSS. ISBN: 978-1-875603-17-6.